More than 40 elite female soccer players are set to sue FIFA and the Canadian Soccer Association this week. The players – including U.S. stars Abby Wambach and Alex Morgan as well as FIFA Player of the Year Nadine Angerer – demand that FIFA and the CSA reverse their decision to play next year’s Women’s World Cup, to be held in Canada, on natural grass instead of artificial turf. Canadian soccer teams normally play matches on turf fields. Of the six venues that will host World Cup matches next summer, five already had artificial turf. The sixth – Moncton Stadium in Moncton, New Brunswick – recently converted its grass field to turf. 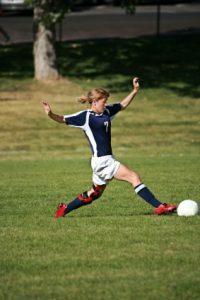 Should girls worry about soccer injuries? When the Canadian Soccer Association submitted its bid to host the event, the proposal specified that turf fields would be used. Canada was the only country to bid on the 2015 Women’s World Cup. Every men’s World Cup held since 1930 has been played on natural grass, as will the tournaments scheduled for 2018 and 2022. Modern artificial turf has changed since the early days of AstroTurf, which resembled thick carpet on top of concrete. Today’s surfaces, such as FieldTurf, consist of synthetic fibers with an infill of sand and rubber. They have become popular in many sports at all levels due to concerns over cost, maintenance and consistency of grass fields. Turf fields are certainly preferable to grass in locations where grass cannot grow or be properly maintained. Canada should be capable of producing and maintaining consistent grass fields for four weeks in the summer. In the letter, the women assert that a FIFA study found that elite soccer players perceive the injury risk to be higher on turf fields than on natural grass. While it is difficult to compare injury rates on the different surfaces due to many variables, a study published last month in the American Journal of Sports Medicine did find that the rate of ACL injuries was higher on synthetic surfaces than on grass in football. No increased rate of ACL tears was found in soccer. ACL injuries are not the only health concerns the players have, though. Players often cite higher risks of foot and ankle injuries. Some experts claim that the surface temperatures on artificial turf are much higher than on grass, causing excessive dehydration and fatigue. And players risk significant skin burns from falls and tackles. Former American soccer star Julie Foudy notes that in the 2013 UEFA Women’s Championship in Sweden, organizers laid sod down on top of a turf field, and the sod held up well for multiple games during the three weeks of the tournament. ESPN the Magazine cites estimated costs between $3 million and $6 million to convert the six fields for the 2015 Women’s World Cup, which pales in comparison to the revenue the event will generate. Ask Dr. Geier – Are ACL tears more common on grass or FieldTurf? If FIFA and the CSA refuse to convert the fields to grass, the players’ lawsuit will likely be heard in an Ontario court in November. ESPN’s legal analyst Lester Munson predicts that the female players would almost certainly win that case. FIFA is calling the Women’s World Cup “the biggest women’s sporting event in the world.” Rather than athletes playing tentatively to avoid injuries, wouldn’t FIFA prefer free-flowing games that showcase the beauty of the sport? If “the future of football is feminine,” as Blatter has publicly claimed, then it’s time for FIFA to show these female athletes the same support the men received in Brazil. Note: A modified version of this post appears as my sports medicine column in the October 2, 2014 issue of The Post and Courier.